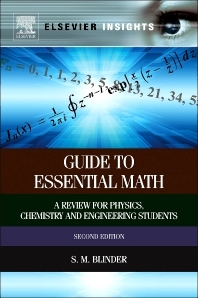 This book reminds students in junior, senior and graduate level courses in physics, chemistry and engineering of the math they may have forgotten (or learned imperfectly) that is needed to succeed in science courses. The focus is on math actually used in physics, chemistry, and engineering, and the approach to mathematics begins with 12 examples of increasing complexity, designed to hone the student's ability to think in mathematical terms and to apply quantitative methods to scientific problems. Detailed illustrations and links to reference material online help further comprehension. The second edition features new problems and illustrations and features expanded chapters on matrix algebra and differential equations. 4.1 What Use is Trigonometry?